Toddlers slump in strollers bouncing across the rough asphalt, and infants only a few weeks old jiggle in their fathers' arms. Others, limp from exhaustion and nearly too big to be carried, are slung across their mothers' chests like sacks of grain, sweaty hair plastered to their heads. There are hundreds of children traveling in the caravan of Central American migrants. That number has fluctuated somewhat as the group's size has grown and diminished, but kids of all ages are still everywhere and at risk of illness, dehydration and other dangers. And if it's exhausting for children, it's perhaps even more so for their parents trying to care for them as they walk long hours in the sun, sleep on the ground outdoors and rely on donations of food and clothing to get by. Pamela Valle, a 28-year-old from El Progreso, Honduras, said no child should have to undertake a migration like this. But unable to find work back home, she said she had no choice but to leave and take 5-year-old Eleonor with her. Each day when they arrive in a new town on the long trek across the steamy southern Mexico countryside, she looks first for a sheltered place to sleep. On this day that was a red tarp that a group of migrants stretched across a playground in the main square of the southern town of Tapanatepec. Then she and Eleonor went in search of food and bathrooms. "I don't think you can prepare children psychologically, but we have to in some way make it like a game, like telling them it's a vacation," Valle said, adding that it has been hard on Eleonor. "It's not right, but sometimes the situation obliges you." With Tuesday's U.S. midterm elections just days away, President Donald Trump has continued to ramp up his rhetoric against the caravan of some 4,000 migrants, repeatedly hammering Democrats and talking of sending as many as 15,000 U.S. troops to the southern border — more than double the number of migrants in this group and three other much smaller ones following in its footsteps hundreds of miles behind. In a lengthy speech on Thursday, Trump promised an executive order next week that would automatically deny asylum to migrants who try to enter the United States illegally between ports of entry. U.S. immigration laws currently allow migrants to seek asylum no matter how they arrive in the U.S. 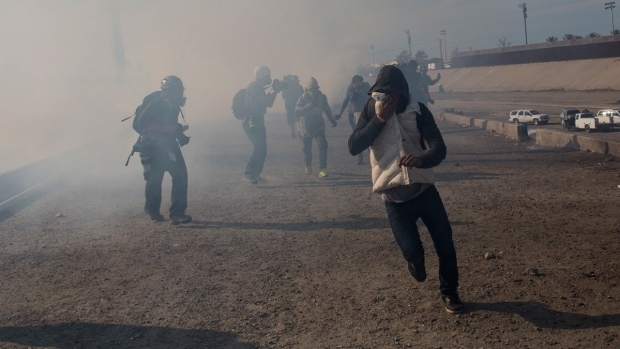 Unless they unexpectedly find some way of traveling faster — and Mexican officials have shown no inclination to facilitate that — they are still weeks away from reaching the U.S. border. Thousands have already dropped out, applying for asylum in Mexico or accepting free bus rides home, and many more are expected to do the same. A caravan earlier this year fizzled to just about 200 who actually made it to the Tijuana-San Diego border. While resting Tuesday in the southern city of Juchitan, in the state of Oaxaca, as members of the group attempted to organize mass transport northward, a Guatemalan woman gave birth to the first known caravan baby at a local hospital. Mexico’s governmental National Human Rights Commission said it had arranged for medical attention for the woman, who was 38 weeks pregnant, and the girl was healthy. The newborn's parents told Telemundo she named the baby Guadalupe Vasquez Perez, in honor of Our Lady of Guadelupe, the patron saint of Mexico, because they consider her a miracle. According to local reports, the couple decided not to continue forward with the caravan and will stay in Mexico where they will join family members in the city of Coahuila. 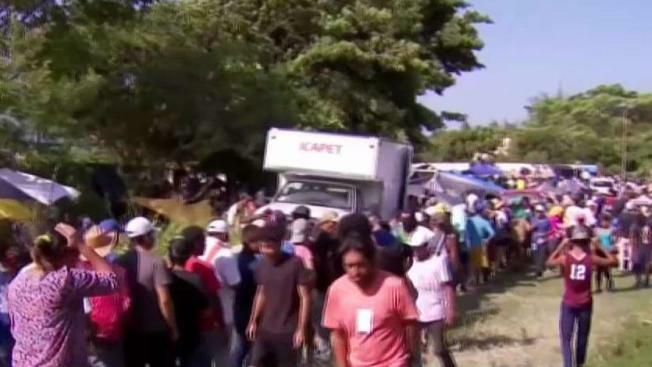 After failing to persuade Mexican authorities to provide buses that would have whisked them hundreds of miles ahead to Mexico City, the migrants were on the move again on foot Thursday, hitchhiking and scrounging rides when they could find them. Their goal for the day was to trek 40 miles (65 kilometers) to reach the town of Matias Romero in Oaxaca state, still more than 840 miles (1,350 kilometers) to the nearest U.S. border crossing at McAllen, Texas. For families the long trek has imposed a particularly grueling routine that has taken a toll after more than two weeks. The migrants rise by 3 a.m. each day to take advantage of cooler temperatures. Parents try to feed kids who are awake while letting those small enough to carry or put in a stroller sleep. Since the group usually camps in town squares and most include some sort of playground, children run around the monkey bars in the dark while their parents pack. On a recent day, one woman walked with a length of black cord tied to the wrists of her daughter and another girl so she wouldn't lose them. A toddler leaned against his older sister, playing with a tiny plastic truck on the edge of the highway, while their mother tried to flag down a passing truck. Still, as young children do, many found ways to lighten the difficult journey with imaginary play. After arriving in Tapanatepec's main plaza, Evelin Flores, a spunky 7-year-old from Tela, Honduras, set to playing her favorite game of "stylist," combing everyone's hair as she loves to do back home. Flores said she sings the traditional Spanish folk song "La Cucaracha," to while away the hours on the road. "It's only that it's really tiresome to walk," she said. Standing on the steps of the town's church, 4-year-old Madelin held a small bible and pretended to preach with Pentecostal fervor, waving her arms and stomping back and forth. Suddenly she grabbed a medicine bottle and, holding it like a microphone, let out a scream. "She's very dramatic," her mother Mileybi Ramos said, laughing at her daughter's antics. Under a sheet of black plastic stretched taut with rocks to weigh it down, 4-year-old Eipril Arguijo Gonzalez flopped onto her 17-year-old brother's bare chest, giggled uncontrollably when he grabbed her and then popped back up to resume pacing around her small space on a church patio where her family was spending the night in the town of Niltepec. "She acts like we're on vacation," said her brother, Jonny. His twin, Jordy, chimed in that in each town where they've stopped, Eipril calls the river the beach. For the Arguijo family, the trip has been hardest on 10-year-old Keneth, who is too old to be carried or pushed in a stroller and knows too much to think this is any kind of vacation. After covering dozens of miles on foot, both of Keneth's feet were shredded with cuts and blisters and he went to a medical tent to have them bandaged. Despite his tender age, he was part of the family meeting in Tegucigalpa, the Honduran capital, when the family decided to flee. Jonny and Jordy had left with their father in August because the gang controlling their neighborhood was trying to force them to sell drugs. They made it as far as the town of Tenosique in Mexico's Tabasco state, not far from the Guatemalan border. But the gang was threatening their other siblings and mother back home, so they returned for them. "Since they were looking for us to sell drugs, they went looking to beat Keneth up," Jordy said. If they make it to the United States, the twins hope to return to school. The brothers were a year away from finishing high school when their parents pulled them out for safety reasons. "First we're going to have to find a place to stay," Jordy said. "Afterward we'll make a little money to buy a house and live normally with our family."